Does this procedural platformer steal Spelunky's crown? What is it? A 2D platformer with procedurally generated levels and randomised loot. Caveblazers is a 2D, sidescrolling roguelike platformer, with procedurally generated levels, randomly rolled loot and permadeath. As you delve down further into a cave full of riches, you'll encounter increasingly more powerful enemies, and find new weapons to kill them with. You'll find gold, and spend it on items and health refills from shrines. You'll find blessings – special, passive buffs that can tweak and enhance you build in surprising ways. And you'll die, in many painful, cheap and sometimes amusing ways—often as a result of your own hubris. On my ninth run I found a blaster. A ranged weapon, it fires a barrage of bullets, but equipping it means a penalty to move speed and jump height. That was a big price to pay, until I realised that, if I shot at the floor, the knockback would propel me upwards, allowing me to jetpack around the room. Suddenly, I could reach previously inaccessible nooks and crannies. The sheer thrill of momentum was intoxicating. Until I blasted straight into a spike pit and died. A Spelunky comparison is inevitable. I don't think Caveblazers is as good as Spelunky—few games are—but it finds success in how it builds on the simplistic perfection of Mossmouth's dungeon diver. For instance, in Caveblazers you have two weapons: one melee, one ranged. This changes how you approach combat encounters, and the abilities of the monsters you face. Many can close distance quickly, forcing you to make a split-second decision. Do you stand your ground and battle, or try to increase the gap—giving you the space to pick them off at range? The randomisation of weapons and upgrades factors in. Maybe you'll end up with an amazing bow, but an underpowered sword. Or a powerful axe paired with a handcannon that's useful in specific situations. The loot defines your build, and changes your strategy each time. On my 11th run, I found a bow that fired homing arrows. Later, I collected a blessing that caused my arrows to ricochet off walls. This was a powerful combination. My ricocheting homing arrows bounced and veered towards targets, giving me an incredible long-range advantage. But my melee weapon – an upgraded, demonic scythe—restored one health point for every enemy killed by it. I could play it safe, and inch closer to death with every mistake, or jump into the fray, and risk losing more health than I gained. It was my best run to date, and made better by the interesting tension at the heart of my build. Caveblazers is quick to punish mistakes, and also desperation. You'll find potions but, in classic roguelike style, they're unidentified. Maybe they'll restore health or increase your melee or ranged damage stats. Maybe they'll decrease those stats, or worse. Health restoration items are a big deal, and rare, and the price of filling your health bar at shrines becomes increasingly prohibitive as you move deeper into the dungeon. You can befriend AI dungeon delvers to help soak up some of the damage, but they can also be a liability. Everything is a risk. 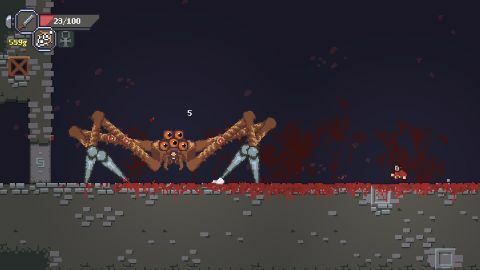 On my 12th run, still fresh off the high of my previous attempt, I made a dumb mistake with some Jumpers—difficult, highly mobile monsters that explode on contact. I limped towards the first boss encounter, and, seeing that it was the flying cube, decided to try my luck with a potion. I drink it, and am immolated – unceremoniously burning to death only two levels in. The bosses are my least favourite part of Caveblazers, largely because of the repetition. As a challenge, they're fine—there are bosses I can kill without taking a hit, but who'll still punish a lapse in concentration. But, unlike in regular play, these encounters mostly remain the same, no matter the build. A better bow may make things quicker, but that only affects the length of the fight, not how I approach it. Despite this misstep, though, Caveblazers is an excellent procedural platformer. It's slightly looser and less intricate than Spelunky, but it scratches the same itch—offering plenty of variety, and a difficult challenge that's fun to unravel.